The episode starts with Vikas Gupta and Hina Khan schooling Benafshah and Priyank for sleeping in the same bed at night. The contestants often criticised Puneesh and Bandagi for their closeness on the shiow and in fact, host Salman Khan also gave them a piece of mind for their PDAs, which he said can be seen by their respective families too. Hina was upset Benafshah, who said that she wanted to be consoled by a friend as she was extremely upset after the day's event (she has been nominated for three successive weeks). Hina said that she could have called someone else or simply wait till morning. 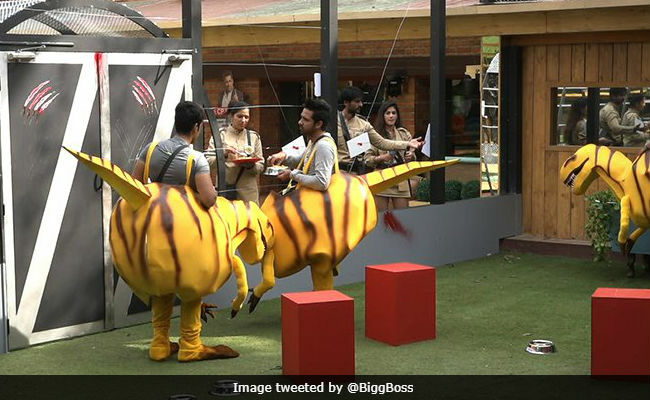 The focus shifts from Benafshah and Priyank to the luxury budget task, for which Vikas, Puneesh and Luv Tyagi had to dress up as dinosaurs while the rest of the housemates had to play theme park caretakers. The task will also decide the next contenders of captaincy. Vikas, Puneesh and Luv will have to pull down pictures of contestants they don't want to participate in the captaincy task and the dinosaur who gets out of their cage maximum will also become a contender in the captaincy task. Contestants took turns to convince Luv, Puneesh and Vikas to save them. Benafshah desperately tried to convince Luv to save her and give her chance at captaincy. Benafshah and Priyank get into a fight because he refused to help her convincing the others. Benafshah, who got herself nominated for 2 consecutive weeks (despite being nominated for the current week), to save Priyank, was appalled. While performing the task, Vikas lost his cool with Puneesh and Luv, who were conspiring to keep Vikas in the cage. They discussed the matter but everything fell apart when Vikas swayed from his words. Vikas told everyone that he was asked to eliminate Sapna Chowdhary from the race but Vikas opted to take Hina out from the captaincy task. After this, Sapna took down her own picture saying that she is making things easy for Luv Tyagi. Hina and Hiten schooled Sapna for jeopardizing everyone's luxury budget - because Sapna broke Bigg Boss' rule. Vikas later explained his actions to Luv Tyagi and Puneesh saying that he backstabbed Luv because he took down Arshi's name even though he requested him not to. Luv Tyagi took Vikas' actions personally and turns against him. He vows to change the game during the next segment, which will be carried out in Thursday's episode. He discussed all this with Benafshah and Priyank. In another part of the house, Vikas told Arshi and Shilpa how Puneesh and Luv tried to undo his game but he got better of them. Vikas thinks that Puneesh and Luv will get involved in a fight soon because of the contestants they favor. In another segment of tonight's episode, Shilpa Shinde reveals that she is hurt by Akash Dadlani's harsh words. Arshi Khan consoles her. Benafshah was hurt by Arshi's accusations. Later Arshi and Shilpa confront Akash and get into a shouting match with allegations and counter-allegations.